How to draw portrait of Qui-Gon Jinn from Star Wars. 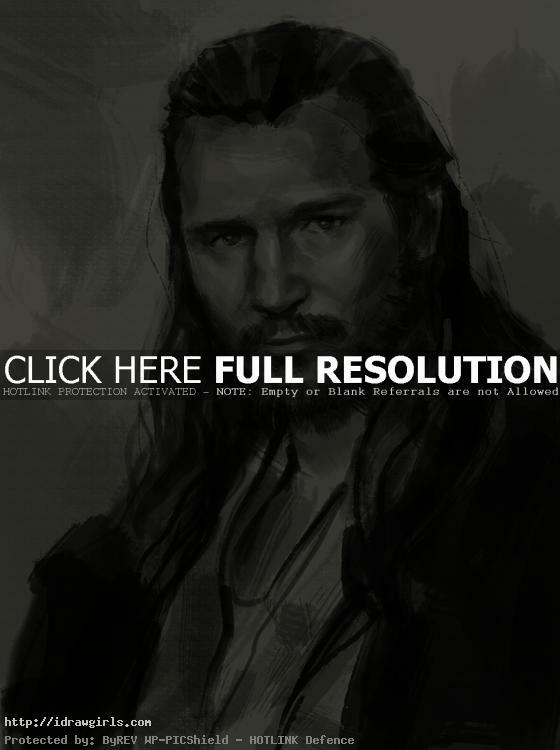 Learn to draw a realistic portrait of Qui-Gon Jinn. In this tutorial, you will learn to draw a master Jedi Qui-Gon Jinn. This step by step tutorial may possibly be easy enough for beginner to follow. But if you already understand how to draw and shade, you will understand the principle a lot more. If you are really a beginner, just try your best to follow the step by step drawing. I am trying to mimic the pencil and charcoal drawing with digital tool. In this tutorial, you will learn to draw light, middle, and dark value in achromatic drawing method. The drawing of this Qui-Gon Jinn resemble an actor Liam Neeson in illustrated black and white style. You will learn to draw facial structure or portrait from a rough sketch to finished black and white drawing of Qui-Gon Jinn from Star Wars. Qui-Gon Jinn was a revered, yet maverick and unconventional Human male Jedi Master. He was the Padawan to Count Dooku, and the mentor to Obi-Wan Kenobi and briefly Anakin Skywalker. Jinn often placed himself in conflict with the Jedi High Council. He was deeply attuned to the Living Force, which contributed to him frequently taking side trips to help seemingly weak and useless life-forms. Despite his opposition to the council, he was regarded by many Jedi as sharp-witted and possessing great wisdom. Here is a final drawing of Qui-Gon Jinn. 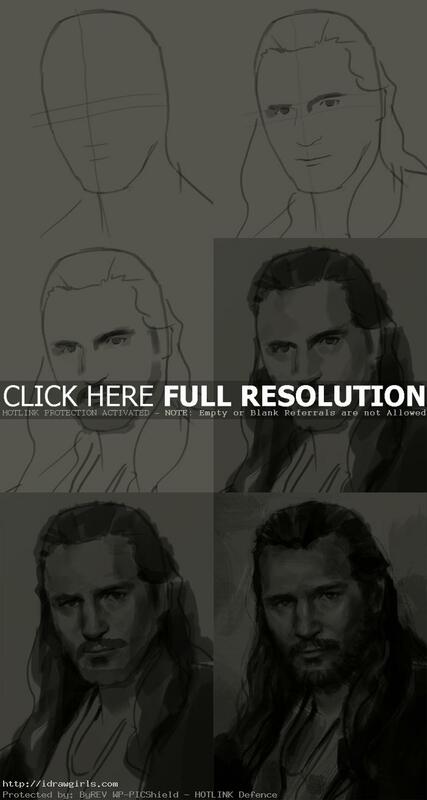 Below are step by step how to draw Qui-Gon Jinn’s portrait. Step one, I sketched his basic facial structure. The vertical line in the middle is a measure line for his facial structure, a pair of horizontal lines are half its height . The parallel lines is where I would place his eyes. The nose mark is half way between the eye lines and bottom of the chin. Then the mouth is half of that. Step two, I drew his eyes, nose, and lips over his existing measure grid lines. Then I drew his hair. Step three, I added his beard and some shadow under his eye’s sockets. Step four, I then painted medium gray over the image. Step five, I started adding some shadow and try to achieve realistic facial structure. Step six, at this step I can add really dark gray and some highlight on hot spots.